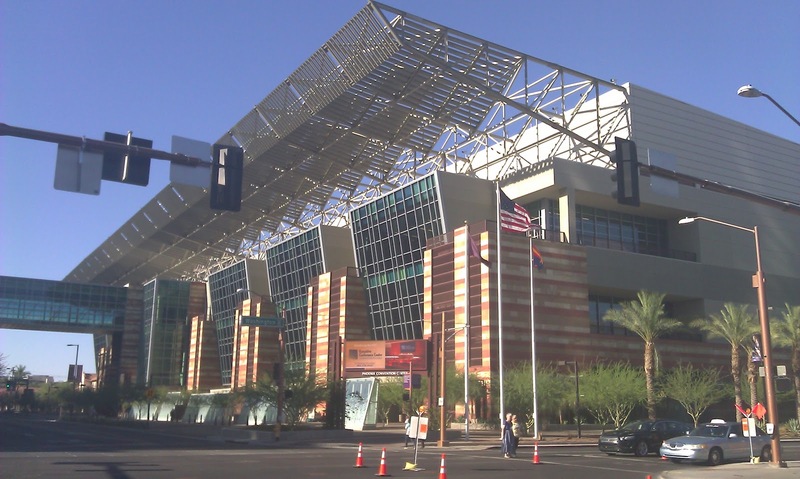 The Unitarian Universalist Association's General Assembly 2012 in Phoenix was my 12th GA. My first GA was 1998 in Rochester, NY. I missed '99, '02, and '03, and have then attended the last 9 in a row. GA 2012 was the first time I'd been to GA without LoraKim since that first one in '98. I stayed at a Motel 6 about 3 miles from the Convention Center. 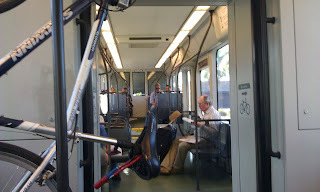 I rode the light rail in every morning, and back every evening. Airport Motel 6 and the Convention Center. rail going by. I bought a 7-day pass for $17.50. banner parade. Here's the AZ delegation. 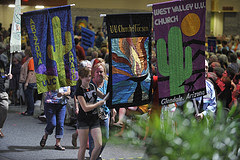 Yay for the banner parade. and once or twice even doing something vaguely helpful. 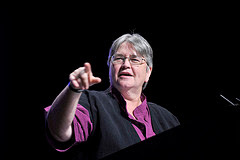 UUA Moderator Gini Courter is my hero! "Depends on how many people are there. That's a lot of resources to be using up, but if enough people are sharing the dogs/cats, then perhaps in some scale it knocks down the nonhuman companion/human companion ratio." But let me speak of General Assembly itself. It was amazing. 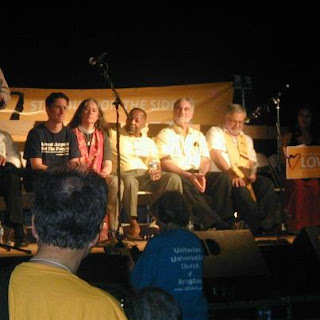 At my first GA in 1998, I was amazed at moderator Denny Davidoff's skill at guiding Unitarian Universalist wrangling toward decisions in which majorities ruled and minorities felt honored and included. When her term ended, I thought no one else could have those skills. But Gini really is amazing -- bringing a hipper style to the wise, nonanxious presence at the helm. I will always remember an episode, a few years ago -- at the 2007 GA in Portland. The agenda was tight, and we were running a little behind schedule. A proposed Action of Immediate Witness was under consideration, and the debate was heated. 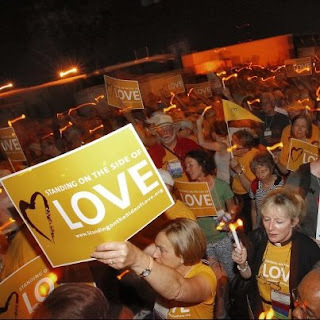 The proposal called for repeal of 'Don't Ask Don't Tell,' and in those days there were advocates for queer rights on both sides, and they formed lines at the Pro and Con microphones to take their 2 minutes each speaking for and against the proposal. In the midst of this, a delegate stepped to the Procedural microphone, which always takes precedence over the next speaker at the Pro or Con mics. Gini: I recognize the delegate at the procedural microphone. Delegate: I'm ____ from ____. Madam Moderator, what is probably more important than whether this Action is passed is the conversation and its complex issues. I was wondering if there were time for prayer? Gini (not pausing a second): There should always be time for prayer. 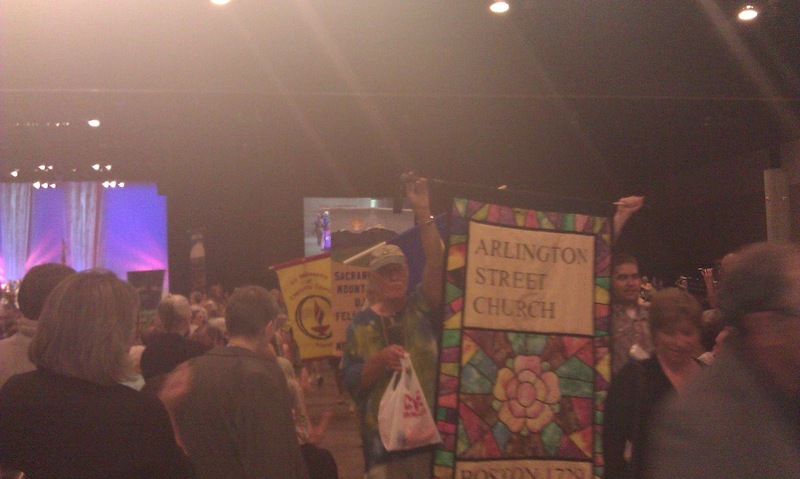 And a couple thousand Unitarian Universalists entered into thunderous silence in that cavernous convention center hall, and prayed. Gini said, "To whomever we pray," and asked "that delegates be reminded there is enough love to go around if we create it; Let us be centered, forgiving and caring." That was five years ago. 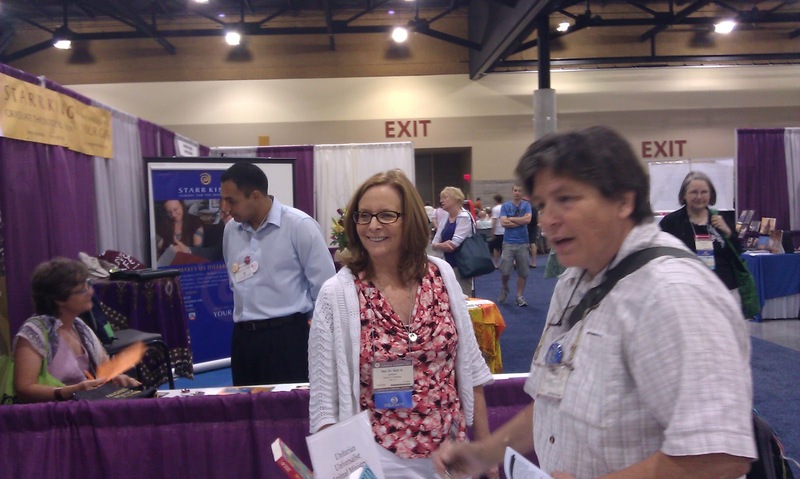 In Phoenix, Gini was as lovely, gentle, and wise as ever. I had actually watched Hinojosa's hour-long Frontline program "Lost in Detention" which first aired on PBS last October. (If you haven't watched it, please do: see here.) As harrowing and horrifying as the immigration detention system is, as revealed in "Lost in Detention," the impact didn't hit me until I heard Hinosjosa's Ware lecture. Five or six months ago, I referred to the immigration situation in a sermon. I called it "the Selma of our generation" and the most significant social justice issue we now face. I was pretty much taking Peter Morales' word for it on these points. (I trust him.) One or two of my congregants criticized me for this. They have their own pet justice issues, and they didn't want their favorite issues minimized. "With our issue still as bad as it is," they said, "you could say immigration was one of the most significant social justice issues, but don't say it is the most significant." I acknowledged the legitimacy of their concern, and let the matter drop. What I was taking Peter Morales' word for before, I am now more firmly convinced of. Our injustice to immigrants is the most significant social justice issue of our time in the U.S. See the Frontline "Lost in Translation," and then watch the video of Hinojosa's Ware Lecture (see it here) and I'm confident you'll agree. At the same time, we must also be aware of how our current system pits oppressed people against each other -- for instance, in grant programs that fund assistance only for groups that can prove they are more oppressed than other groups. In the competition for the distinction of "most oppressed group," we all lose. (This was a point made during a talk I heard during "Ministry Days" when the ministers gather for a couple days immediately before General Assembly begins.) The abuses of immigrant detention must be seen not just as an immigrant issue or a hispanic issue. If my country can do this to anybody, then everybody is in danger. So let's stop comparing the levels of oppression of various groups -- for this only helps solidify the status quo -- and let's recognize that if we allow the kind of treatment that is now going on in these detention facilities, then that treatment is more likely to befall anybody. Indeed, if we wake up to the truth that we are each other, then we realize that those abuses are happening to us. 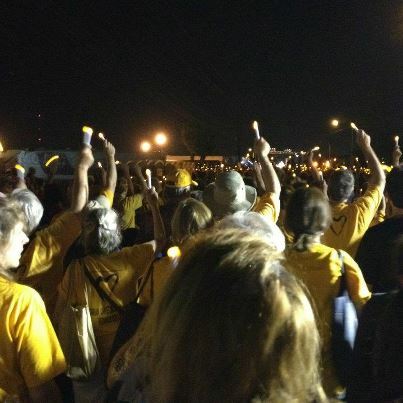 Saturday was the day of the vigil at tent city. Most of GA attendees were in their yellow "Standing on the Side of Love" (SOSL) t-shirts for the day. 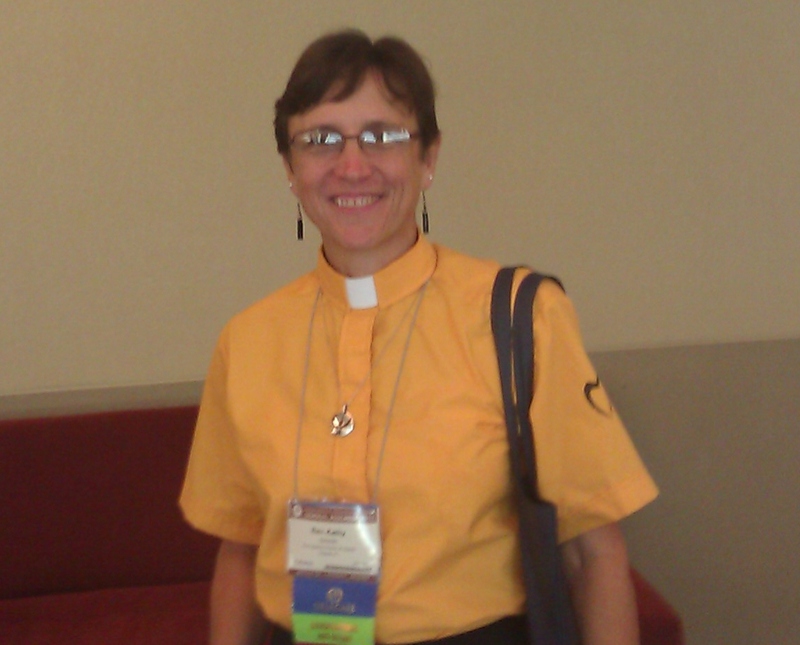 A number of our clergy had yellow clergy shirts with the SOSL heart logo on the sleeve. A delegation of a few UU leaders had a tour of Tent City before the rest of us arrived. 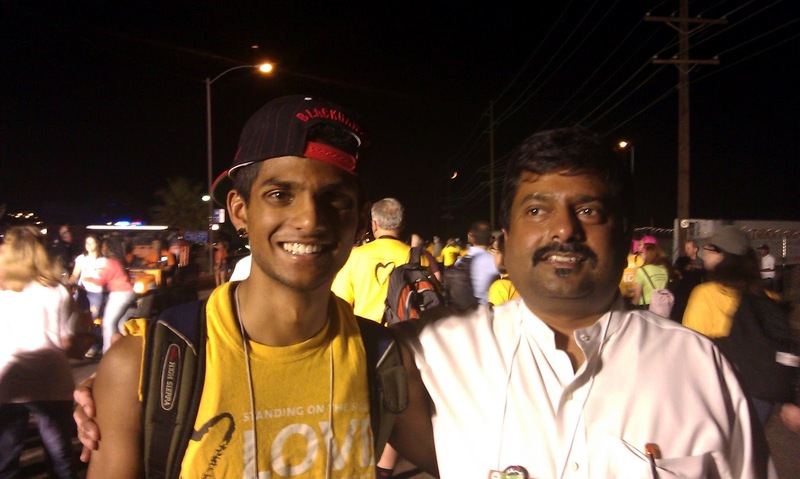 Read about the delegation's experience (see here). We got on buses, and we went to the "tent city" detention facility. There were a couple thousand of us. 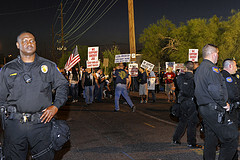 The Associated Press coverage of the event (article here) was carried in 247 newspapers across the country. Check out the "Storify" account of the vigil: see here. ...then Unitarian Universalists can have Canaries! the jockey look is what you're going for. Police with riot gear were there. and a dozen or so counter-protestors showed up. Speakers on the dais who took turns addressing the crowd. 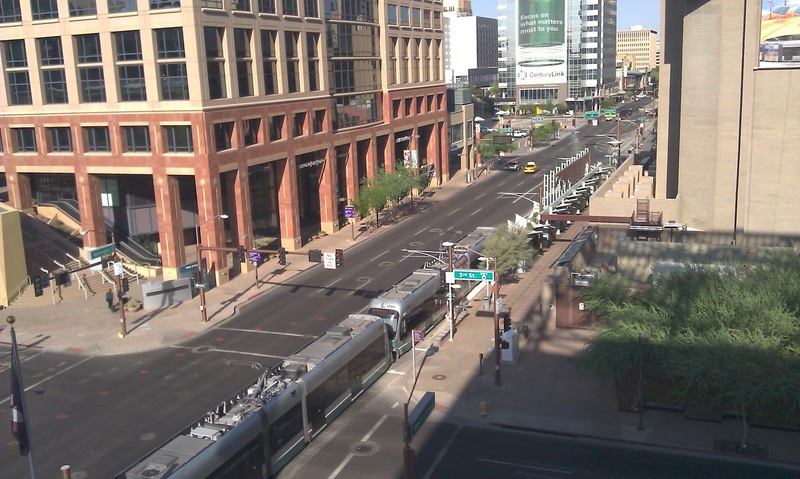 The local news in Phoenix devoted a nearly-four-minute story to covering the vigil. "Look at that crowd!" 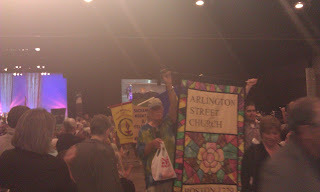 For a 15-minute video of speakers addressing the crowd at the vigil -- Rev. 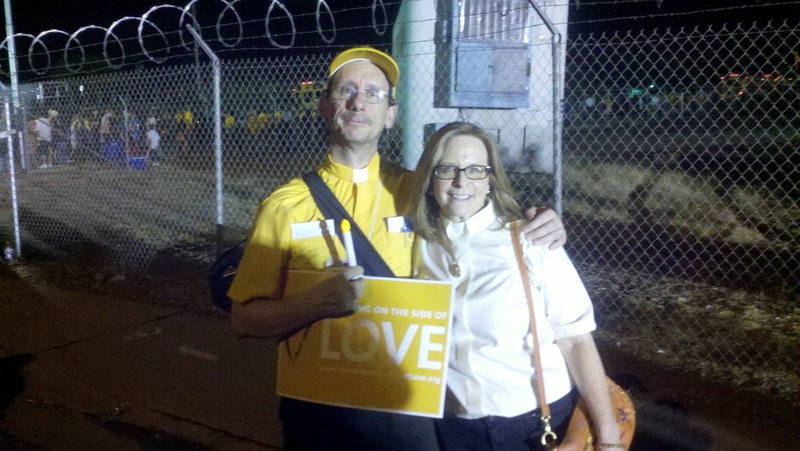 Susan Frederick Gray (minister in Phoenix), Carlos Garcia (Puente Arizona), Rev. Peter Morales (UUA President), Rev. 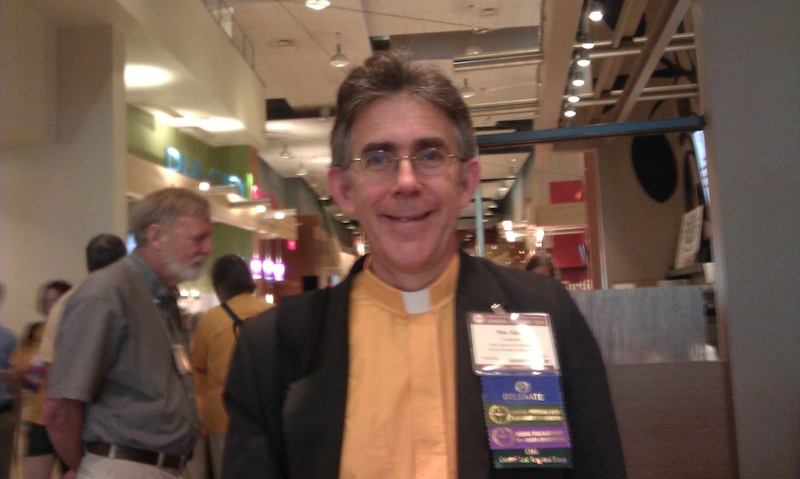 Geoffrey Black (UCC President), Rev. 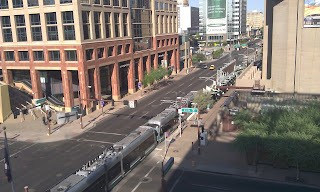 Warren Stewart (Baptist minister in Phoenix) -- see here. 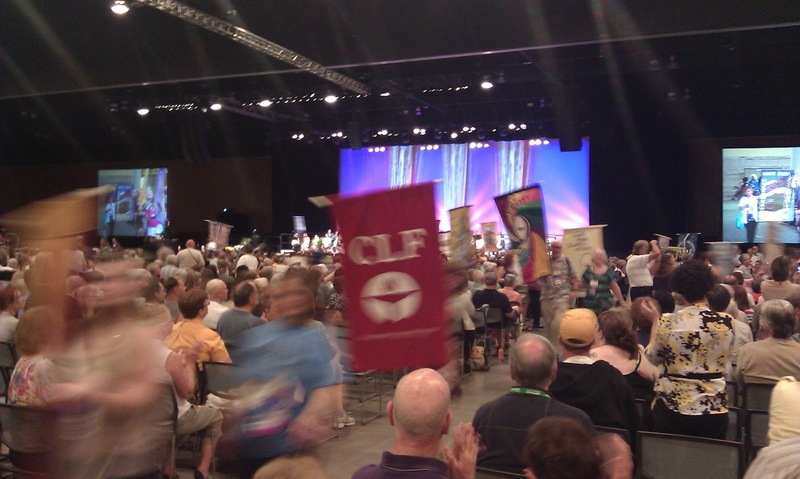 The next day after the Saturday night vigil was the final day of GA. At the end of the last plenary session, Gini Courter gave her annual moderator's report. She said: "All over the country UUs expect transformation,” -- both personally and socially. This "Justice GA" of 2012 has transformed what GA is. "We know we have power. We know we are called." so that bounty is shared and no one is left out. and good is uncovered and sustained. even when we do not yet know it. this is the work of our faith. Delegates gave Gini a standing ovation -- standing, and still standing, on the side of love. Thank you, Meredith, for this personal and very informative and inspiring account of GA. Great pics. Will return to watch videos. 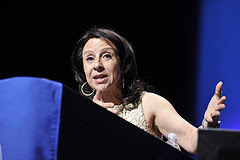 I did see Maria Hinojosa's Ware lecture live online Saturday night--after getting Phoenix's timezone straight (MST, not MDT), and now I want to watch the Frontline piece she did. What a great closing benediction. I've made a copy to carry with me. Thanks again. I agree with Jack. I was truly moved by that benediction. We should read it every day.